This classic vintage stainless steel cocktail shaker stands 10 inches tall and is unsigned. 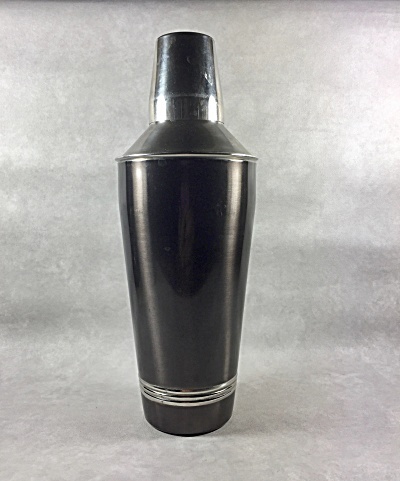 The shape of this vintage cocktail shaker is a classic Art Deco shape but since it is made out of stainless steel it is most likely from the 1960s. The cap doubles as a jigger. The metal top has the strainer at the top for easy pouring. This is no new reproduction. It is patinated in black to contrast with the stainless steel top and bands at the bottom. So, with all the great vintage cocktail recipes out there, which one would you choose to make for this sleek beauty?